The strap of this stunning gold necklace is composed of several loop-in-loop chains that are connected with double cross-linking and terminal caps at each end of the strap. At the bottom edge of the necklace a fringe of beechnut shaped pendants hangs, each with granules at the tips and a miniature columnar base. Rosettes in the form of gentle six-petal flowers add to the floral motif and serve to discreetly mask the point at which each pendant is attached. The caps at either end of the necklace are decorated with a single similar rosette and etched leaves; ringlets curl at the edge of the terminal that meets the strap. 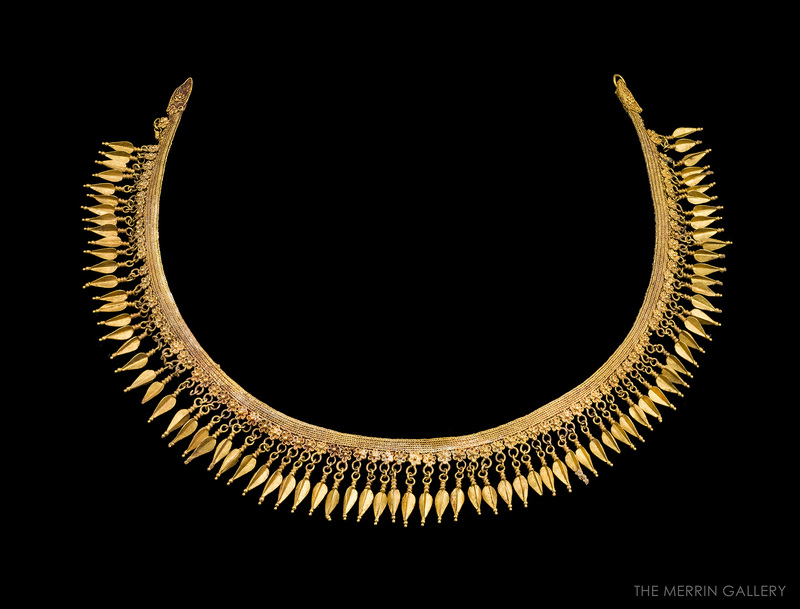 Many hundreds of joining operations were necessary to link the gold in the strap of this necklace together in a remarkable process that involved neither soldering nor melting the delicate gold. The craftsmanship on this piece is superb. A prevalent style of necklace during the fourth century BC, strap necklaces with a fringe of identical pendants have long been a part of ancient Greek jewelry and can be found depicted on vases of the Hellenistic Period. In fact, this necklace type has been discovered throughout the ancient Greek world ranging from Greece and southern Italy to the lower edge of the Black Sea. Similar pieces are on display in both The Metropolitan Museum of Art and The British Museum.